Surprisingly this is the first time Much Ado About Nothing has been performed at the Queen’s Theatre. 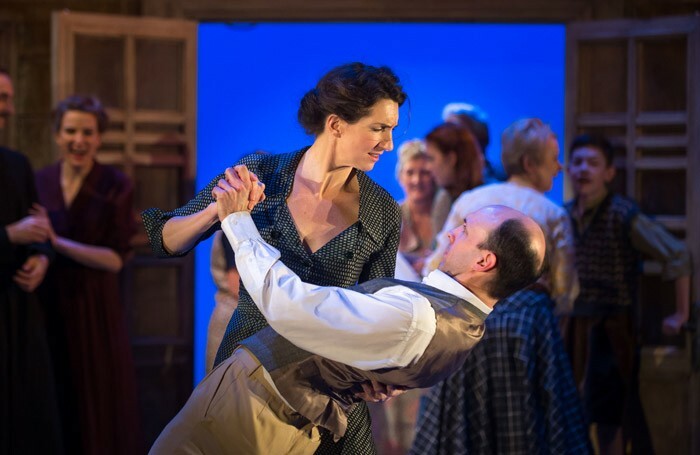 The venue has a great pedigree when it comes to interpreting Shakespeare and this continues with this 1940s post-war take on the play widely considered to be a template for the romantic comedy, with its appealingly nostalgic jazz soundtrack. New artistic director Douglas Rintoul’s inaugural Hornchurch production is a polished affair. In performances that belie their relative professional inexperience, Amber James, as the innocent yet resolute Hero, and the versatile James Siggens as love-struck Claudio, both confidently portray the smitten sweethearts. Mark Jax’s caring Leonato expresses the anguish of a loving father betrayed, travelling from joviality to worry and despair – the audience shares in his evident pride during times of joy, yet also empathise with his mental turmoil. The real star here though, with her barbed remarks and sarcastic jousting, is Hattie Ladbury’s Beatrice. She’s well paired with the jester-like Thomas Padden as Benedick, and their unorthodox courtship is a pleasure to watch. Effortlessly shifting through dramatic gears, they both deliver their lines with impressive comic timing and witty mannerisms – a pleasure to watch.